Galway East Tourism - Fleadh na gCuach in East Galway, West of Ireland.Galway East Tourism - Fleadh na gCuach in East Galway, West of Ireland. 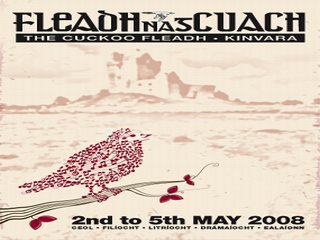 Fleadh na gCuach (The Cuckoo Fleadh), a hugely enjoyable and successful traditional music and community-based arts festival, takes place every May bank holiday weekend in the beautiful, scenic village of Kinvara. A well-established and richly deserved reputation has ensured that the Fleadh has become a showcase for the best in traditional music, attracting musicians from all over the country and beyond. The Fleadh lasts four days leading into the holiday weekend, and welcomes locals and visitors of all ages to experience the beautiful coastal village of Kinvara at its vibrant best. See www.kinvara.com for a full description and timetable of events.